Did fire breathing dragons ever exist? Fire breathing dragons are described in ancient legends from all over the world and are even described in the Bible. That no modern reptile can perform such a feat does not necessarily mean that none ever existed. In fact, various creation scientists have proposed very interesting and distinctly plausible mechanisms by which a dragon or dinosaur-like creature might actually have been able to breathe fire. While fossils do not tell us for sure whether these creatures could actually breathe fire, examples such as the bombardier beetle show God's wisdom and ability to design wonderfully complex biological mechanisms to accomplish all sorts of amazing feats. 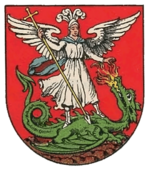 This crest displays Siegfried as he slays the dragon Fafnir. Legends of firebreathing dragons have fascinated people for centuries and appear in cultures all over the world throughout history. Firebreathing dragons exist in artwork and literature, but is it possible that they also existed in real life? Nearly all cultures have dragon legends, although they had no contact with each other, and the Bible even speaks of the fire breathing Leviathan. It seems possible that all these legends might have been based on a real creature, specifically a dragon or dinosaur-like creature that had biological mechanisms which allowed it to breathe fire. The Legend of Smok Wawelski (the Dragon from Wawelski) tells of "a most horrible fire-belching dragon" with purple wings that terrorized the citizens of Krakow, Poland. According to the story, the dragon terrorized the countryside around Wawel Hill until the hero, named Krakus or Krac, came up with a solution. He smeared a yellow sulfur paste on sheep which the dragon ate, causing the dragon to burn with thirst. It drank and drank from the River Vistula until it burst, and Krakus (or Krac) became king of the city, which was named Krakow in his honor. In Denbigh, a tale persists of a dragon (saurion) that terrorized the town, wreaking desolation with its fire breath. Sion Bodiau (Sir John of the Thumbs), a man with two thumbs on each hand, was commissioned to kill the beast. He succeeded in this by beheading the dragon while it was distracted by his unusual thumbs. In Welsh, Denbigh is called Dim-Bych, meaning "no more dragon". In the epic peom Beowulf, the hero Beowulf fights his final battle against a fire breathing dragon. This large dragon measured about 50 paces in length. After a servant of Beowulf's steals a cup from the dragon's treasure, the enraged creature begins attacking the countryside. Beowulf sets out to fight the dragon and kills it with the help of his friend Wiglaf. Unfortunately, the dragon bites Beowulf and he dies due to the effects of its venom. During the reign of Queen Elizabeth I, a fire breathing dragon lived in Yorkshire until the heir of More Hall killed it. The knight wore a suit of armor covered in spikes to keep the dragon from swallowing him while he tried to kill it. In Celtic mythology, the fire dragon (Draig-tiene) was one of types of dragons that were each responsible for a different element of the earth. The fire dragons symbolized energy and taught people to overcome obstacles with courage. "There lived once upon a time in Sutherland a great dragon, very fierce and strong. It was this dragon that burnt all the fir woods in Ross, Sutherland, and the Reay country, of which the remains, charred, blackened, and half-decayed, may be found in every moss. Magnificent forests they must have been, but the dragon set fire to them with his fiery breath, and rolled over the whole land... Men fled from before his face, and women fainted when his shadow crossed the sky-line. He made the whole land desert. And it came to pass that this evil spirit, whom the people called the 'beast' and 'Dubh Giuthais,' came nigh to Dornoch as near as Lochfinn, and when he could see the town and spire of St Gilbert, his church—'Pity of you, Dornoch,' roared the dragon. 'Pity of you, Dornoch,' said St Gilbert, and taking with him five long and sharp arrows, and a little lad to carry them, he went out to meet the 'beast.' When he came over against it he said, 'Pity of you,' and drew his bow. The first arrow shot the beast through the heart. He was buried by the towns-people. Men are alive now who reckoned distance by so or so far from the 'stone of the beast' on the moor between Skibo and Dornoch. The moor is planted, and a wood called Carmore waves over the ashes of the destroying dragon." In the poem Tristan and Iseult, a fire breathing dragon attacks Ireland and the desperate king promises his daughter Iseult in marriage to whoever can kill the beast. Tristan goes in search of the creature, and when he meets it he stabs it in the mouth with his spear. The dragon fights back and nearly burns Tristan with its breath of fire and smoke, but its pain eventually overcomes it and Tristan kills it and cuts out its tongue as proof of his victory. In Greek mythology, the Chimera was a combination creature with the body of a lion in front, the body of a goat in the middle, and the body of a serpent in the rear. It was said to have three heads, one of each animal. The chimera was the daughter of Typhaon and Echidna and was raised by Amisodarus, king of Caria. It later turned on Amisodarus and began attacking the countryside. King Iobates commanded Bellerophon to kill the creature. Bellerophon followed the creature into the sky on Pegasus and stabbed it in the mouth with a lance, suffocating it. This creature is associated with a Lycian volcano. The account of Bellerophon and the Chimera is described in Homer's Illiad: "First he [Iobates] sent him [Bellerophon] away with orders to kill the Khimaira none might approach; a thing of immortal make, not human, lion-fronted and snake behind, a goat in the middle, and snorting out the breath of the terrible flame of bright fire. He killed the Khimaira, obeying the portents of the immortals.". One of the most famous dragon legends in Norse mythology is the story of Fafnir (sometimes Favnir or Fafner). Fafnir was a prince, the son of the dwarf king Hreidmar and brother to Otr and Regin. After Otr was killed, Hreidmar received a fortune from Andvari in compensation for his loss. Fafnir then killed his father for the gold and shape-shifted into a dragon to guard his treasure. His brother Regin and Regin's son Sigurd (sometimes Siegfreid) snuck into Fafnir's lair and killed him by stabbing him in the belly. Fafnir was described as a large reptile with giant teeth and claws, small wings, and the ability to breathe fire. Fafnir has been depicted in artwork throughout Norway, including the Sigurd Portal, housed at the University of Oslo. Fafnir also appears in the opera The Ring of the Nibelungs by Richard Wagner as a giant that guards its treasure. Dragons appear in Roman mythology as well as in their artwork. According to Perle Epstein (1973) “This creature [dragon] was usually represented in classical art as a fire breather with large bat's wings...” In addition, Hercules had a fire breathing dragon on his shield. A story from France tells of the Peluda, a giant fire breathing creature with four legs, claws similar to a turtle's, a scaly tail, green fur, and quills on its back. It was killed by a young man whose fiance it had devoured. 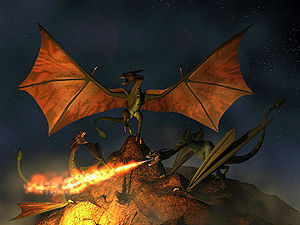 Fire-drakes appear in several Celtic and European stories and are described as flying, fire breathing dragons. They supposedly lived on the British Isles and in caves in the mountains of northern Europe. The last dragon that Beowulf fights is a fire drake. They also appear in the Lord of the Rings books under different names. JRR Tolkein calls these creatures the Uruloki—they include Smaug, Ancalagon the Black, and Glaurung. A legend of the Swiss, Bavarian, and Austrian Alps tells of the Tatzelwurm ("clawed worm"). This bipedal, serpentine creature was said to have a head like a cat and is often referred to as a drake. A herdsman shot a similar creature in 1921, and another one was spotted attacking a herd of pigs in Sicily in 1954. The Gaasyendietha exists in the legends of the Seneca people. It could shoot fire from its mouth and was also said to travel across the heavens in a stream of fire. For this reason it is also called the meteor-fire dragon. This fire dragon was said to live in the depths of rivers and lakes. "The Indians shuddered as they looked at the monster’s skeleton. The bird had fallen so hard they thought, that its bones were partly sunk in the rock. But the braves could see that its wingspread was as big as four tall men standing on top of one another. The strange creature had fierce claws on its wings, as well as on its feet, and the beak was long and sharp. There was a long, bony crest on its head. The Indians knew that they had never seen a bird like it before." The description of the Thunderbirds matches that of some type of pterosaur, possibly a pteranodon. In Illinois, the Illini Indians tell a similar story of the Piasa (the "bird that devours man"). This giant bird preyed on large game animals and even people until one day the Illini Chief came up with a plan to kill it. He stood out where the Piasa could see him, and when it swooped down to grab him, twenty warriors emerged from the bushes and killed the Piasa. John Russell, a writer, later entered the cave where the Piasa lived and found it covered with a "mass of human bones". Mayan relief sculptures, figurines from Acambaro, Mexico, and Ica stones from Peru all show similar pictures of lizard-like creatures with wings. These pictures strongly resemble the pterosaur class of dinosaurs. A legend from Indonesia tells of Ananta Shesha, a serpent that supposedly emerged from the body of Balarama, brother to the sun-god; it had several heads that could breathe fire. "The Eastern dragons were assuredly weather-lords. Floods were caused by dragons fighting in the water and storms by dragons fighting in the air. Lightning was heavenly fire sent to stop the dragon fights, for dragons fear fire. This last might be considered odd, in view of the dragon's own fiery breath, but the Chinese writer Wang Fu said: 'Dragon fire and human fire are opposite. If dragon fire comes into contact with wetness it flames, and if it meets water it burns. If one drives it away by means of fire, it stops burning and its flames are extinguished.'". "And the LORD sent fiery serpents among the people, and they bit the people; and much people of Israel died." --Numbers 21:6 KJV. Several other Bible verses make reference to these creatures as well, although the phrase "fiery serpents" is often translated as "venomous snakes". "Who led thee through that great and terrible wilderness, wherein were fiery serpents, and scorpions, and drought, where there was no water; who brought thee forth water out of the rock of flint;" --Deuteronomy 8:15 KJV. "Rejoice not thou, whole Palestina, because the rod of him that smote thee is broken: for out of the serpent's root shall come forth a cockatrice, and his fruit shall be a fiery flying serpent." --Isaiah 14:29 KJV. "The burden of the beasts of the south: into the land of trouble and anguish, from whence come the young and old lion, the viper and fiery flying serpent, they will carry their riches upon the shoulders of young asses, and their treasures upon the bunches of camels, to a people that shall not profit them." --Isaiah 30:6 KJV. Some authors feel that the "venomous snake" interpretation does not fit with the meaning of the original Hebrew phrase. The word m'opheph means "fiery" and signifies a quick back-and-forth type movement. This is frequently interpreted to refer to the quick bite of a venomous snake, but that action does not contain any side-to-side movement. The word saraph means "fiery serpent" and, interestingly, also refers to the seraphim that fly around the throne of God. Isaiah uses this word to describe the seraphim, possibly because they remind him of fiery snakes that he had seen. "…but Moses prevented the enemies, and took and led his army before those enemies were apprised of his attacking them; for he did not march by the river, but by land, where he gave a wonderful demonstration of his sagacity; for when the ground was difficult to be passed over, because of the multitude of serpents, (which it produces in vast numbers, and indeed, is singular in some of those productions, which other countries do not breed, and yet such as are worse than others in power and mischief, and an unusual fierceness of sight, some of which ascend out of the ground unseen, and also fly in the air, and so come upon men at unawares, and do them a mischief,) Moses invented a wonderful stratagem to preserve the army safe, and without hurt; for he made baskets, like unto arks, of sedge, and filled them with ibes, and carried them along with them; which animal is the greatest enemy to serpents imaginable, for they fly from them when they come near them; and as they fly they are caught and devoured by them, as if it were done by the harts;"
Many other historians make reference to similar flying serpents, including Aristotle, Aelianus, Ammianus, Mela, Cicero, Solinus, Philae, and Matthew of Edessa. Furthermore, seals and other artwork have been found with images of what appears to be Nehustan. Nehustan was the bronze snake that Moses made when the Israelites were attacked by serpents in the desert. God provided healing to those that were bitten and then looked upon the bronze snake. Unfortunately, the snake later became a snare to the Israelites and they worshipped it as an idol. In the depictions of Nehustan, the snake has bat-like wings and spines on its tail, much like a pterosaur. Authors and naturalists from the Middle Ages also knew of these creatures; Marie Trevelyan wrote that they "looked as though they were covered with jewels of all sorts". Writers, mapmakers, and historians continued to document these creatures throughout the 16th and 17th centuries, and similar creatures were seen in Germany, Norway, and the French Alps. Prosper Alpin, a French naturalist, wrote about flying serpents in Egypt, and his descriptions bear a striking resemblance to modern pterosaur fossils. Many Native American tribes held similar legends that told of Thunderbirds--flying serpents that supposedly brought thunder from their wings and lighting from their mouths. The discovery of Ropen, possibly pterosaurs living in Papua New Guinea, has affirmed the possibility that the flying serpents described in the Bible might have been actual pterosaurs alive during the time of man. After hearing several first-hand accounts from people who had come into contact with flying serpents in the southwest Pacific and seeing videos of native from Umboi Island who had seen these creatures, Jonathan Whitcomb traveled to Umboi Island in Papua New Guinea himself to further research the possibility of living pterosaurs. These creatures were described as having long tails, and they give off a bioluminescent glow that reminds one of fire. Many scientists and researchers believe that the Ropen are actually Rhamphorhynchoid ("long tailed") pterosaurs. The Rhamphorhynchus can be described as a pterosaur with bat-like wings, a horn or beak on its head, and a diamond-shaped tip at the end of its long tail. The Bible talks about a creature called the Leviathan, a fire-breathing monster of enormous size that lived in the water. The creature God describes here is often thought to be some sort of crocodile, but the full description in Job 41 tells of a much larger and more fearsome creature. Verse 25 says that, "When it rises up, the mighty are terrified; they retreat before its thrashing", and verse 33 calls it "a creature without fear". Also, crocodiles cannot breathe fire, yet the Leviathan is said to do so. Some say that the Leviathan was not a real animal, claiming that this passage includes exaggerated poetic descriptions that should not be taken literally. However, other real animals are mentioned earlier in the passage, including the horse, hawk, and ostrich, so it would make sense for the Leviathan to also be a real creature, although that does not mean that it must still be alive today. Many creationists theorize that the Leviathan was actually some type of dinosaur. These gigantic reptiles certainly match the description of the terrifying Leviathan, with its great strength, mighty teeth and limbs, and impenetrable scales. . Although we do not currently know of any fire-breathing creatures, that does not mean that they could never have existed. The fact remains that God, as the all-powerful Creator, created all life on earth and certainly could have created a fire-breathing dragon or similar creature if He had chosen to. Therefore, the possibility that such a creature existed at one time should at least be considered. The opinions of creation scientists differ as to whether or not fire-breathing dragons could have existed. Currently, of course, no known fire-breathing animals exist, but fire-breathing dragons appear in legends from so many cultures, that many think these legends may be based on actual creatures. Many creation scientists note the similarities between the descriptions of dragons and the characteristics of dinosaurs. If a dinosaur once existed that could breathe fire, this would account for many of the stories of fire-breathing dragons. The Leviathan may have been such a creature, although the Bible does not call it a dinosaur. Actually, the word dinosaur was not invented until 1841, so people before then would have called dinosaurs by other names. A writer at Creation Worldview Ministries puts forth one potential method by which dinosaurs may actually have breathed fire. According to this author, dragons could have used methane gas to fuel their fire breath. When mammals consume plants, the digestion of this plant matter produces flammable methane gas in their intestines. The same process could have occurred in dragons, even in sea-dragons if they consumed things like kelp, and they might have stored this methane in some kind of special bladder or chamber until they needed to breathe fire. This methane gas could be easily ignited in several ways. Some theorize that this spark could come from steel-tipped teeth clicking together, or from electrical sparks produced using mechanisms similar to those found in an electric eel. A chemical, such as arsene gas (AsH3) or diphosphane gas (P2H4), could also have been used to ignite the methane. Many animals already produce these chemicals in their bodies to some degree. It has been noted that the skulls of many dinosaurs had large empty cavities. These cavities may have been used to enhance the dinosaurs' sense of smell or to increase their vocal resonance. However, fossils do not show things such as internal secretions or glands that may have existed inside such cavities. The Parasaurolophus (“Crested Lizard"), for example, had a large crest on its head, which extended from its nostrils over the back of its neck. Inside this crest, there were large nasal cavities. It is possible that chemicals could have been combined in these cavities and then sprayed from the Parasaurolophus's nostrils. Upon exposure to oxygen, these chemicals would ignite and form a stream of fire. Peter Booker, a writer for the Journal of Creation (previously TJ), proposes another potential fire-breathing dinosaur. Based on the description of the Leviathan in Job chapter 41, Booker suggests that this creature might correspond to the dinosaur known as Sarcosuchus imperator, or the Super Croc. This ancient reptile fits with the biblical description much better than other candidates such as the modern-day crocodile, and it may have even been able to breathe fire. The Super Croc, discovered in 1966, was described in a 2001 National Geographic article as having scales like "an impenetrable shield" and jaws "armed with a deadly row of enlarged incisors" (qtd. in Booker 15). In addition, Sarcosuchus reached up to 40 feet in length and weighed as much as 10 tons. This certainly matches the description of the fearsome Leviathan in Job. Most interestingly, the Super Croc had what National Geographic described an an "enormous cavity under the nostrils" (qtd. in Booker 15). Scientists thought that this cavity might have contributed to the dinosaur's sense of smell or vocal quality, but the true purpose remains unknown. Perhaps this cavity belonged to part of a biological mechanism that allowed the Super Croc to breathe fire, possibly by mixing chemicals in much the same way that the bombarier beetle does. The book Dragons of the Deep by Carl Wieland also asserts that Sarcosuchus may have been the Leviathan. Wieland notes the formidable qualities of Sarcosuchus, such as its thick scales, each of which reached about a foot in length, or its terrible jaws, which held over 100 teeth. Wieland speculates that the cavity in Sarcochusus's nose, called a "bulla", may have been part of a fire-breathing mechanism. Wieland also notes that, if Sarcosuchus was the Leviathan, then it must have been alive after the Flood in order for Job to be familiar with it. "One of the locals set his two mastiffs onto the monster, and apart from losing his dogs he was fortunate to escape alive from the encounter, for the dragon was already credited with the deaths of a man and woman at whom it had spat and who consequently had been killed by its venom." Corrosive venom fired from sacs in the creatures mouth, much like that of venomous snakes, that burned and produced smoke and even fire where it landed, could account for dragons' reputations for 'breathing fire'. Bombardier beetles shoot extremely hot, noxious chemicals out of their abdomens using a uniquely designed biological mechanism. While the possibility of fire-breathing dragons remains uncertain, God certainly could have created such a creature if He had wanted to, and historical accounts of such creatures abound. No true fire-breathing creatures are known to exist today, but several animals can shoot venom or caustic chemicals in a similar fashion. The bombardier beetle, an amazing creature, can shoot chemicals out of its tail at up to 100 degrees Celsius! The beetle has two secretion lobes that secrete hydroquinone and aqueous hydrogen peroxide. The same cells secrete both of these chemicals, and they collect in a special reservoir in the beetle's abdomen. This reservoir opens into a reaction chamber through a one-way valve. When threatened, the beetle contracts the muscle-lined reservoir to send the chemicals into the reaction chamber. Enzymes (catalase and peroxidase) are secreted into this chamber as well, and these cause a reaction that releases oxygen, quinones, water vapor, and heat. The chemicals quickly heat up, and pressure causes the mixture to shoot out of the end of the beetle's abdomen at high speeds through two tubes. Different species of beetle have different methods for directing the spray, such as spray nozzles, lined grooves, or special deflector plates. 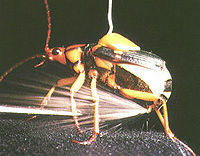 The bombardier beetle uses its extremely hot, noxious chemical mixture as a defensive mechanism. It can fire its chemical weapon within 90 milliseconds of being attacked. The stream of chemicals issues from the beetle, accompanied by popping noises and steam, at speeds between 325 and 1950 centimeters per second and can be directed accurately at predators and attackers. Additionally, some beetles can spray their chemicals at rates of up to 500 pulses per second. If a tiny beetle can possess such a sophisticated mechanism in its tail, then a dinosaur or dragon could also have had a similar mechanism that would allow it to breathe fire to defend itself. Other animals possess amazing defensive mechanisms as well. The spitting cobra, for example, can spray venom from its fangs at distances of over 10 feet. Perga dorsalis wasp larvae, or Spitfires, secrete a vile yellow fluid from their mouths when disturbed. Other species of wasp larvae "sting" people using tiny hairs with stinging cells on the ends. Electric eels can produce up to 600 volts of electricity at one time, and fireflies produce light in special organs through a chemical reaction . These creatures are further examples of the marvelous creativity of God. He has designed some incredibly complex mechanisms in all kinds of animals, and He could easily have done the same thing in fire-breathing dragons as well. 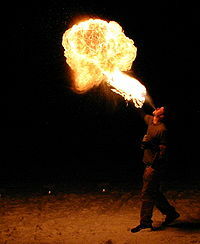 Fire breathers shoot fuel out of their mouths to create a stream or ball of flame. Humans can also "breathe fire", in a sense. Many performers use chemicals, which they hold in their mouths and then spray over a flame source to create a stream or ball of fire. This practice illustrates how dragons may have breathed fire at one time. Chemicals, which on their own would not hurt the animal, could have been stored in a special bladder or cavity and then ignited right as they left the dinosaur's mouth. However, since humans were not designed with any protective mechanisms for breathing fire, people should take great care when attempting to do so. Fire-breathing is one of many different fire arts, and it is definitely the most dangerous one. Professional fire breathers make it look like they can shoot plumes of fire out of their mouths. Although they may make it appear simple, DO NOT TRY THIS AT HOME! Fire-breathing is extremely dangerous and potentially deadly if performed incorrectly. All fire breathers start with the same basic tools: fuel and a flame source. Common fuel choices include kerosene, lamp oil, and naphtha (lighter fluid). When choosing fuels, fire breathers select things with high flash points, meaning that the fuel requires a higher temperature to ignite. They also look for fuels that are less toxic and produce less smoke and odor. Fire breathers avoid using alcohol and gasoline because these both have low flash points (they will ignite easily). Also, alcohol can cause drunkenness, which should never be combined with fire-breathing. To make it look like they can actually "breathe" fire, fire breathers hold the fuel in their mouths and then shoot it over a flame source, such as a torch. They must take care in selecting their torches as well as their fuel. Torches are often made of metal, which won't catch fire, and then bound with special cords. Rags, cotton cloth, and ordinary rope should never be used in fire torches because they will burn through and fall off, possibly into the mouth of the fire breather. It requires a lot of practice to master these techniques and achieve the proper angles, so most fire breathers begin by practicing with water to avoid injuring themselves. Fire breathers must take many precautions to avoid injury to themselves and their audiences. First of all, fire-breathing and the other fire arts should never be practiced alone. Those attempting to learn fire-breathing should only do so under the supervision of a trained professional. Also, fire breathers should ensure that no one is standing too close during their routine and that the wind is not blowing too strongly, which may cause the fire to go where it is not supposed to. In addition, many fire breathers perform without wearing any clothing on their upper body that may catch fire. Even with all these precautions, however, fire-breathing remains very dangerous, and accidents can be fatal. One common accident happens when the fire travels back along the stream of fuel shot from the firebreather's mouth. It may enter their mouth and cause the performer to ignite if they are not careful. Also, all the fuels used are toxic to a certain extent and should not be ingested or inhaled. Inhaling fuel often leads to hydrocarbon pneumonitis, which is so common among fire breathers and eaters that it has been called "fire eater pneumonia." Other health problems that may result from fire-breathing include skin irritation, dry mouth, gum disease, stomach ulcers, poisoning, and chemical pneumonia or acute respiratory distress . The many dangers of fire-breathing show that, if a dragon were to have breathed fire, it would need an intelligently designed system to do so. Otherwise, chemicals might mix or ignite at the wrong time, which would be disastrous for the dragon. If God did create a creature that could breathe fire, he would have given it special adaptations to protect it from the intense heat. Regardless of whether or not such creatures existed, it remains a fascinating topic that still has much room for research and speculation. ↑ Polish Legends, Folklore, Myths and Stories Anglik.net, Magda Pospieszna, 2003, 2/16/11. ↑ The Dragon Stone: The Dragons of Beowulf Polenth Blake, 6/18/07, The Dragon Stone, 2/16/11. ↑ Celtic Dragon Symbolism, Legend and Lore by Jill Stefko, Suite101.com, 6/28/10, 2/16/11. ↑ 6.0 6.1 The Celtic Dragon Myth by J.F. Campbell, 1911, at sacredtexts.com, 2/16/11. ↑ KHIMAIRA , 2008, Theoi Project—New Zealand, 2/16/11. ↑ Fafnir, The Nordic Dragon by Marisa E. Martínez Pérsico, 2007, Linkmesh.com, 2/16/11. ↑ 9.0 9.1 9.2 9.3 9.4 9.5 Giants, monsters, and dragons: an encyclopedia of folklore, legend, and myth by Carol Rose, New York: W. W. Norton & Company, 2001. ↑ 10.0 10.1 10.2 10.3 Thunderbirds: Did the American Indians see ‘winged dinosaurs’? by Bill Johnson, Creation Ministries International. ↑ Dragons of China by John P. Painter, Nine Dragon Baguazhang, 2/17/11. ↑ 13.0 13.1 New view on the "fiery flying serpent" by Jonathan Whitcomb, 3/25/2010, The Bible and Modern Pterosaurs, 2/17/11. ↑ Deuteronomy 8 (King James Version) Bible Gateway, 2/17/11. ↑ Isaiah 14 (King James Version) BibleGateway.com, 2/17/11. ↑ Isaiah 30 (King James Version) BibleGateway.com, 2/17/11. ↑ Fiery Flying Serpent : Rhamphorhynchus by Dale Stuckwish, 12/29/10, examiner.com, Clarity Digital Group LLC, 2/17/11. ↑ 19.0 19.1 Job 41 (New International Version, ©2010) BibleGateway.com, 2/6/11. ↑ Historical Support for the Coexistence of Dinosaurs and Humans (Part II) by Eric Lyons, Apologetics Press :: Reason & Revelation, October 2007 - 27:73-79, 2/3/2011. ↑ 21.0 21.1 21.2 The existence of fire breathing dragons Creation Worldview Ministries, Centella Consulting, 2011, 1/24/11. ↑ Behemoth and Leviathan—Creatures of Controversy by Eric Lyons, Apologetics Press :: Reason & Revelation January 2001 - 21:1-7, 2/3/2011. ↑ [Dinosaurs by Design] by Duane T. Gish, Ph.D., Arizona: Master Books, 1992, pp. 80-83. ↑ A new candidate for Leviathan by Peter Booker, Journal of Creation (previously called TJ), vol 19, issue 2, August 2005, pp 14-16, 2/6/11. ↑ [Dragons of the Deep] by Carl Wieland, Arizona: Master Books, 2006, pp. 44-46. ↑ [After the Flood] by Bill Cooper, 1995, pp. 77-78. ↑ 28.0 28.1 Preliminary observations of the pygidial gland of the Bombardier Beetle, Brachinus sp. by Mark H. Armitage and Luke Mullisen, Answers in Genesis, First published: TJ (now Journal of Creation) 17(1):95–102, April 2003, 2/15/11. ↑ Spitting Cobra Tigerhomes.org, 2006, 2/15/11. ↑ Perga dorsalis (Spitfires) Mikes Rides, 7/21/10, 2/15/11. ↑ More Information About Electric Eels WhoZoo, April 2003, 3/20/11. ↑ Firefly Facts: Bioluminescence Marc Branham, 1998, 3/20/11. ↑ 33.0 33.1 How Fire Breathing Works: 3. Torches and Fuel Tracy V. Wilson, Discovery Health, 2011, Discovery Communications Inc, 1/14/11. ↑ 34.0 34.1 Fire Eating and Fire Breathing FAQ Peter Bendall, 1996, Juggling Information Service, 1/14/11. ↑ How Fire Breathing Works: 4. Dangers and Safety Tracy V. Wilson, Discovery Health, 2011, Discovery Communications Inc, 1/14/11. Fire Breathing Home of Poi, Ltd. 2011, 1/14/11. Firebreathing: How Firebreathing works Anne Marie Helmenstine, About.com, 2011, The New York Times Company, 1/14/11. Fire Eating/Breathing: A brief history of Fire Eating and Breathing Greg Schoppe, Culture of Fire.com, SMI/Toud, 1/14/11. How to Breathe Fire Safely and Easily Quazen, 12/15/08, 1/14/11. Fire Breathing: How to Breathe Fire Without Flammable Liquids William Lake, associated content, 5/6/09, Yahoo!, 1/14/11. Dinosaurs and the Bible Clarifying Christianity, 2005, 1/14/11. Dragons: animals...not apparitions Timofey Alferov, Creation ex nihilo 22(3):14–16, June 2000, Answers in Genesis, 1/14/11. Dinosaurs--Alive After Babel? Paul S. Taylor, 2/13/08, Answers in Genesis, 1/14/11. Leviathan Joe Geek, 5/9/07, Creation, Dinosaurs, and the Bible, 1/14/11. Bestiary: Fabulous Beasts, Men, Spirits Aaron Atsma, Theoi Project, 2007, 1/14/11. Animal Planet Videos: Dragons: Did Dragons Breathe Fire? Animal Planet, 4/30/09, Discovery Communications Ltd, 1/14/11. Dragons – Myth or Real? by R.L. David Jolly, Creation Revolution, 2/11/11, 2/16/11. Fire Breathing Dragons and Fiery Flying Serpents (Topic#: 16036) God Said Man Said, 7/25/02, 2/16/11. New view on the "fiery flying serpent"
This page was last modified on 2 September 2014, at 21:38.